We are two months into the Butser Mosaic project and everything is going well and gathering pace. As we move into week 9 we should have ‘squared the circle’ by completing the decorative corner patterns around our central, circular designs. These four…. let’s call them ‘corner pieces’ (although, as they are around a circle, that’s a bit dodgy)…. consist of two separate ‘motifs’. One we’ll call a lotus and the other a scallop shell. 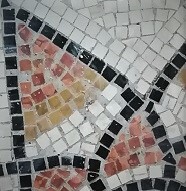 The two motifs are diagonally opposite each other in the original mosaic. One recent head scratcher was figuring out which one goes on the left and which the right as you walk into the room. There are a few photographs of the orientation of the mosaic in the original excavation but, on close inspection, a couple of these appear to have been reversed when printed into the reference books! Fortunately, we were able to reference the monograph – the book published by the Hampshire Field Club and Archaeological Society – authored by David E. Johnston and Johnathan Dicks. This features beautiful illustrations by David Neal, including a plan of the villa with the orientation of our mosaic. Interestingly, David Neal, along with Stephen Cosh, produced a four-volume survey of Romano-British mosaics with hand-painted copies of the majority of known examples. One key reason for doing this was the inadequacy of photography to accurately record detail…. now we know why. We have also had two new recruits join the team: Linden and Richard, both keen field archaeologists. Now they get to experience what it’s like to lay the things they dig up! Once our scallops and lotuses are complete we will have laid around 4 square metres of mosaic. We have done a few back of the envelope calculations: about 35,000 tesserae laid and 500 kg of mortar used -all mixed by hand (ouch). The next phase is to move on to the 4-strand guilloche. Here’s a photo of the mock-up version…. only 2 square metres of that to lay!